My original thought was to use incandescent lamps again, as they still provide the most even spectrum spread (http://micro.magnet.fsu.edu/primer/lightandcolor/lightsourcesintro.html), but it is really difficult to get the colour temperature up to anywhere near daylight values. However there are some good fluorescent sources around now like the Philips Graphica Pro range, which is widely available and also cheap! 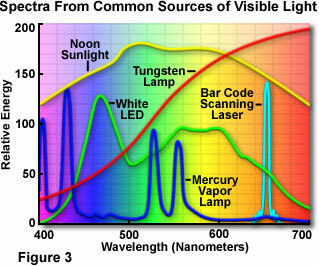 LED sources, while theoretically with a similar starting point (original source is UV and has to be modified with phosphors to get a useful visible light spectrum), are difficult to source to a specific standard and also have very non-uniform dispersion patterns which make this type of application awkward. The next challenge is to get even illumination. Print size is 50 cm X 40 cm and either orientation can be used. I modelled a line source above and below the viewing area, 42 cm from the surface and with the sources 7.5 cm outside the viewing area (which is 70 cm high). 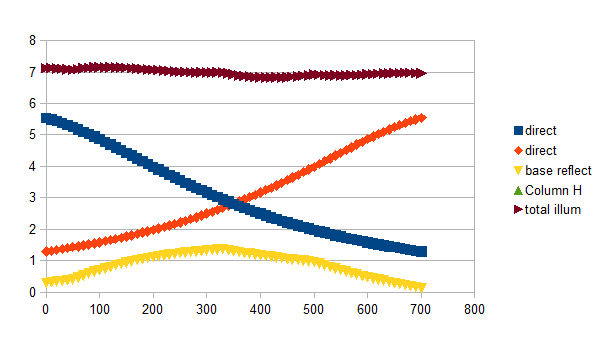 As expected this shows a drop-off half way up of about 1 stop, not too bad, but quite noticeable. To keep things simple I added a simple flat reflector to the base, just forward of the source, with appropriate placing this evens out the illumination very nicely. Clearly tubes are not a line source, but this is encouraging enough to go for a quite mock up to try it out for real. Overall size: To allows 3 prints side by side (the illumination of the outer 2 can suffer), and allow use of portrait mode we want the overall height to be 70 cm (height of the clear viewing space between the top and bottom boxes), a width of 1.8 m allows for a 5' fluorescent tube which should give a nice wrap around light for 1 or even 2 prints in the centre (I don't know why wrap around light should make a print look better, but maybe we'll find out). For reasonably easy transport, target weight is 15 kilos - not light, but given the size a fair compromise.